Ready to pull on for that added layer of warmth to your core this VX-3 Pro Quilted Gilet in Navy is perfect for these winter months. Made from a tough polyester, this quilted gilet ensures the heat stays in and the cold stays out and comes with a soft lining that ensures there's no irritation. The full zip keeps out the wind allowing the wearer to determine their fit and feel. With 2 side zip pockets to store away valuables, this gilet will match any item of clothing in your wardrobe. Designed with the VX-3 logo proudly printed on the chest in white this gilet comes in a smart and simple black design. 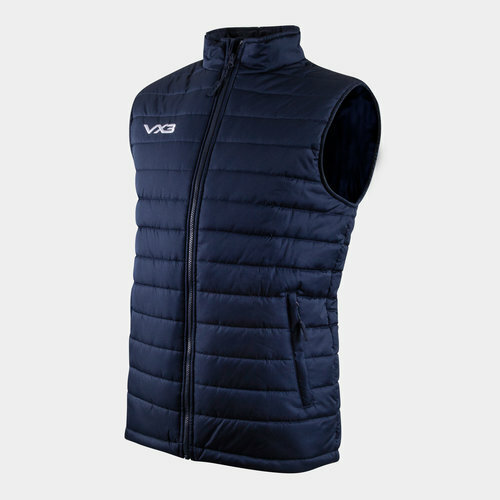 Ideal for sheltering your core from the cold, you'll be able to proudly pull on this VX-3 Pro Quilted Gilet anywhere.